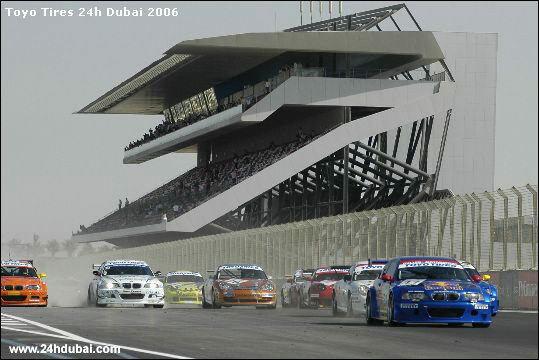 The Toyo Tires Dubai 24 Hours was won today by Duller Motorsport’s Red Bull-backed BMW M3 E46 GTR, this car having taken pole position. Dieter Quester, Hans-Joachim Stuck, Phillipp Peter and Toto Wolff were the victorious quartet, having led almost throughout: they suffered a slight delay in the fourth hour. The race was red-flagged ("race stopped by code red") at 3 am. for a fiery accident (two cars involved, both drivers are reported to be all right), and restarted at 4:32. Second went to the Hubert Bergh Motorsport Porsche, and third to Gene Sigal and Matt Alhadeff of Grand Am team Sigalsport, in the AC Bratislava Porsche. The 1600cc class was a whitewash for the Australian Mirage team. The new BMW 120d of Schubert Motors won the diesel class by a country mile, and came home in ninth overall. The full run-down of the results is listed here. Text covering the way the race developed can be found here.